Has The Facelifted Porsche 991 GT3 Just Been Leaked? If it has, we can't wait for it to arrive. It hasn't always been a custom of Porsche to introduce mid-life facelifts on all of its offerings, but the trend itself does appear to be gathering pace at the sports car maker from Stuttgart. That trend itself is probably best exemplified in the current Porsche lineup via the 911, with the various models and iterations of the rear-engined sports car being given tweaks and detail changes ever since the turbocharged Carrera was introduced in 2015. And it seems that same nip-and-tuck mindset will be coming to the GT3 range very soon. 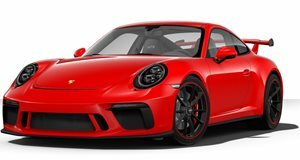 According to new posts on the Czech website AutoForum.cz, a new Porsche configurator tool in the Netherlands has unintentionally showcased the 911 GT3 facelift way earlier than planned. Though the claimed styling changes themselves aren't admittedly that groundbreaking or revolutionary, they do help sharpen up the GT3's overall look. The slimmed-down daytime running lamps and revised front air intake arrangement gives the 991.2 GT3 a pointier and more aggressive look, the side skirts seem to be a wee bit different and the taillights are now identical to the ones brought out through the staggered facelift we referred to earlier. All in all, simple tweaks that, though not ground breaking, do neaten things out a bit. It's currently unknown what else is being brought along with this facelift, but you can expect more than just cosmetic changes to the 991.2 GT3. Power is likely to be bumped up slightly (we're expecting somewhere in the 470-hp camp) and we wouldn't be surprised if Porsche Motorsport managed to trim a bit of weight off here and there from the car's 3,142 lbs curb weight. The big rumour being circulated at the moment, though, is of the GT3 facelift being christened by the re-introduction of a six-speed manual transmission. It's not 100% official, but we'd like to believe that's what's going to happen. After all, we doubt Porsche engineered a new stick-shift just for the measly 991 911 R units it made.